Performing an ITS sword dance with former classmates. Also, proof I wear colors other than green. If you've been around my blog for a while, or you've read up on my history at all, or you even read yesterday's blog post, you know that I danced ITS for a couple of years. 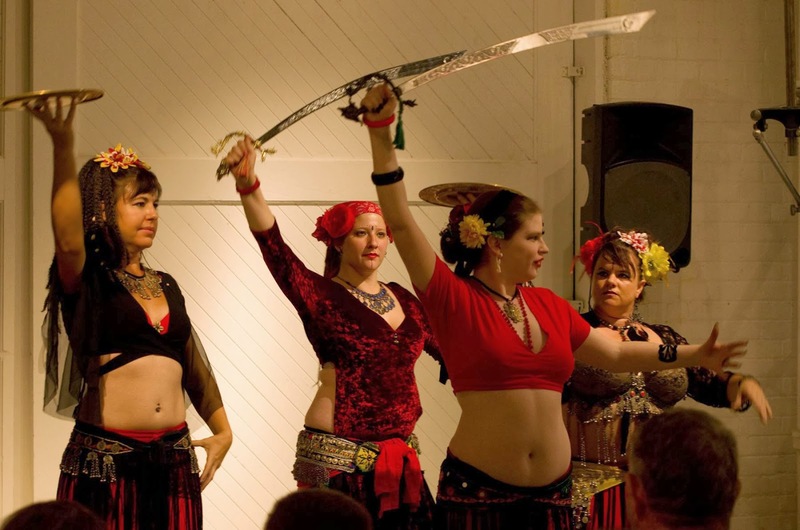 I studied and performed primarily under Anaya Tribal, but also here in Tucson as part of the Tucson Tribal Bellydance Collective (shown above). 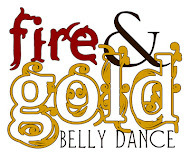 I got my start in bellydance taking a few private home lessons from a friend who used to be part of a tribal improv troupe. She taught me some basics before becoming too busy to keep trading lessons with me (I was teaching her jewelry making), but I continued on my own at home, working with what she showed me and trying things that I saw in videos. After a couple years I got bored dancing alone at home and thought it would be fun to be in a troupe like my friend talked about, so I needed to take classes and find friends to dance with. My search eventually lead me to Plaza de Anaya in Tempe -- Ok, I got a coupon from the Ren Faire and decided to take a free class. After trying a class and seeing how little I really knew, I was hooked and wanted to learn it all. I decided to drive up to Tempe every week (3+ hour round trip) to study with Anaya Tribal. I spent a couple of years dancing ITS and I loved it. I enjoyed the follow-the-leader mentality, I liked that everyone got a chance to be the leader, I loved spinning around in a 25 yard skirt and feeling like a princess. I went every week unless I was sick or out of town, I did my homework, I took whatever workshops my teachers recommended. We had student recitals twice a year where I got to dance with my classmates. What a blast! Although I loved dancing ITS in a group, I also did some solos here in Tucson since I didn't have a group to dance with. Although I never really thought about it specifically, I think my ideal situation would have been performing long shows with an ITS group where we did group improv and had some featured soloists (one of whom would be me, of course). I also wanted to teach bellydance someday. I took workshops in various other styles but didn't absorb a lot of it, for two obvious reasons: one was that I took workshops willy-nilly without really knowing if they were going to give me what I needed at that stage in my dance life, and two was that I really only knew how to dance ITS, so a lot of what was being covered in the workshops was not really accessible to me. I continued to love ITS, and I even began taking extra ITS classes with Fonda in Tucson, but I started to wish I could study more tribal fusion. No one was really teaching what I wanted to learn in Tucson, I couldn't go to Tempe twice a week to study with Mia Donna, and I didn't want to give up Anaya Tribal. In fact, I joined their student troupe -and- the Tucson Tribal Collective. Then Jolie moved to town. She was only going to be here for about 6 months, but she was going to teach classes for that time and I figured well, I had better learn everything I can from her during that time, so I bought an unlimited class card and added her classes to my rotation. If I remember correctly, that meant I was dancing with Jolie Mon and Tues, Fonda on Weds, Anaya on Thurs, and then I had troupe practice for Anaya and/or TTC on at least every other Sunday. I was dancing a lot, and I loved/hated it. I love to dance but my inner introvert wanted more time at home to bead in front of the TV. When Jolie decided to stay in Tucson and invited me to join the student troupe she was forming, I had to do some hard thinking. I was starting to get burnt out on driving to Tempe 6 times a month, and I was starting to think about my future as a dancer. I realized that my end goal was to be a tribal fusion soloist, and that dancing ITS wasn't helping me towards that goal. I left Anaya Tribe, and eventually also the Collective, and focused on tribal fusion. During this time, I was also really discovering my limitations. Start a move on the left foot? Nope. Do an undulation without a floreo? Nonsense. Chaine turns? I think not. My body did not like stepping outside of the comfort zone that I had built for it. ITS had such specific ways of doing things, to make sure everyone looked the same while dancing together, which is great for ITS and lousy for trying to learn anything else. Two years after starting tribal fusion with Jolie, I am still struggling with habits that I developed as an ITS dancer (for instance, my husband likes to tease me because I still look for a leader to follow during choreographies that I could do in my sleep). I don't regret the time that I spent learning ITS. It did a lot to build my confidence, helped me develop a sense of rhythm, taught me to play the zills, and introduced me to some great friends. But if I had to do it over again, knowing then what I know now, I would have made more of an effort to practice general dance skills alongside my ITS moves. I would have forced myself to do everything on the left as well as the right, and I would have played with layering and other challenging concepts at home. I spend a lot of my time now feeling like I am making up for lost time, time that I could have spent developing myself as a dancer, rather than just as an ITS dancer. Ultimately, this is why I disagree with the assertion that one NEEDS a foundation in some form of tribal group improv to be a tribal fusion dancer. Most of what I learned in ITS classes has not served me in tribal fusion. I could have just as easily learned my Basic Egyptian, Arabic, Turkish, 3/4 Shimmy and more from a tribal fusion teacher, and been developing skills as a soloist as well.